Pan Fried Oysters produce a delightfully fresh tasting oyster within a crispy light crust. 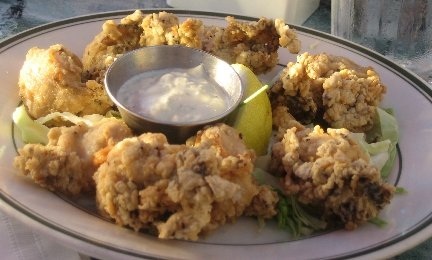 I, personally, have never had oysters that tasted as wonderful as these Pan Fried Oysters. They were so easy to make and so absolutely delicious! When I think of this pan fried oyster meal, I start to drool! * Learn How To Shuck Oysters. 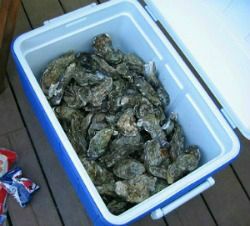 May also used fresh-shucked bottled oysters (found in the refrigerator section of the meat section), if desired. ** Check out Making Homemade Bread Crumbs. Use may also substitute soda cracker crumbs, cornmeal, and/or Panko crumbs for the bread crumbs. You can also mix any of these in the the bread crumbs. Your choice! Place shucked oysters in a colander to drain. 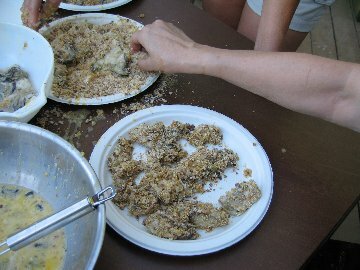 Dip drained oysters in beaten eggs, and then in bread crumbs seasoned with salt and pepper (coating each oyster thoroughly). Set aside to dry at least 1/2 hour. NOTE: An easy way to coat the oysters with the bread crumbs is to place the crumbs in a resealable plastic bag, add egg-dipped oysters, seal bag, and then gently shake. Heat vegetable oil in a frying pan (I like to use my cast-iron frying pan) to 370 degrees F. or until quite hot. Fry oysters until golden brown on one side, then turn over each oysters carefully to brown the other side, approximately 1 to 2 minutes on each side. Fry oyster until golden brown and edges are curled. Do not overcook or overcrowd in frying pan. Remove from frying pan and serve immediately. Serve with Lemons Wedges, Tartar Sauce, Cocktail Sauce and/or your favorite hot sauce. Our favorite way to eat pan-fried oysters: Place an oyster (or oysters) on a slice of good-quality French bread, squeeze a little fresh lemon juice on the oyster, and then add your favorite hot sauce. So good! Keep the unopened oysters cold but do not store in water! Remember, oysters are alive and need to breathe, so never seal them tightly in a plastic bag. Sandwich a layer of live oysters between two (2) beds of ice. Place them deep side down (to retain their juices). I do this in a portable (picnic-type) chest cooler. Never immerse live oysters in fresh water or melted ice – it will kill them. Oysters stored this way will keep for 2 days. This is the method to use if you plan on using the fresh oysters soon. Store live oysters in the refrigerator at 40 degrees F. if they are not to be used immediately. Place them deep side down (to retain their juices) in an open container. Cover the oysters with a damp towel or layers of damp newspaper. Oysters stored this way will keep up to 5 to 7 days. Open (shuck) shortly before serving – not more than 2 hours. The colder the oyster, the easier it is to shuck. Keep oysters cold at all times, partly for safety and very much to enhance flavor and texture. So easy and simple to make and so delicious! These oysters make a great appetizer. My husband just loves these! My husband and I can make a dinner of these oysters! Give them a try – if you are an oyster lover, you won’t be disappointed. I am 56 years old and I love to cook good food. Never, Never have I had oysters so delicious as tonight. I found the recipe on your “Whats Cooking Amereica.” It was the Bomb! I have cooked pan fried oysters for years, with panko crumbs, cracker crumbs, flour, dipped in egg, no egg, fried in butter, oil, and so on. Tonight surprised me so much! I must let you know, you are my new “chef” hero. Thanks Linda, you made my year in food! – Cindy in Coeur d Alene, Idaho. One of the great delights I have is to try out the good old fashioned recipes at home from the local ones I have on my travels and I could eat these fried oysters every day. My mother rolled a bag a saltines with rolling pen, dipped in egg and milk mixture put crackers in bag with oysters and fry in butter. 65 yrs old and they are a hit!! I just happened to have a bag of SEASONED CROUTONS (French Bread) on hand. Rolloled them and used for the coating. Were excellent.